…or subtitled: Thankful I Didn’t Die in the Meantime. May is National Celiac Awareness Month. For me, it a reminder of where I was ten years ago, with my body collapsing from a myriad of painful symptoms that I was to learn were caused by a little known and baffling condition, one I may have had since birth. I cannot pinpoint an event that signaled when celiac disease started for me, but I remember in my teens and into my twenties having spells of carrying around a bottle of Pepto Bismol in my purse because of recurring sudden onset of diarrhea. If you’ve always been this way, and your well-meaning mother thrusts a Pepto Bismol bottle at you and says, “There’s probably something in the water,” you don’t think anything of it. Also, I did not have the type of relationship that I discussed such things with my mother, nor with anyone. In our society people will speak of intimate affairs on television, but are not about to mention the words diarrhea or constipation. In my early thirties I did mention, in passing, stomach pain to my doctor; I was prescribed the then-new (and of course expensive) drug, Zantac. It worked! For the next decade, symptoms of digestive stress and low energy and melancholy seemed to abate. I got so busy with being a mother, a wife, a writing career, and enjoying my horses and all manner of nice living that I did not notice declining health creeping up on me in my late forties. It began with aching joints and back. I had always suffered the aching, but it became more severe. My doctor ordered a bone scan; the result showed osteopenia, at the age of 46. I was told to take calcium. Then I began to suffer aching elbows, arms, shoulders. Sometimes I lay in bed at night and ached all over. My hair seemed to be falling out in globs when I washed it; I thought perhaps I was imagining it–until I no longer could deny it. I woke up many mornings with my face half swollen and suffered recurring canker sores. It was about this time, when I was forty-nine, when my husband went on the Atkins Diet. I joined him, and experienced losing five pounds and feeling great. I had not known I felt bloated all the time, until I no longer was. Unfortunately, having lost the five pounds, I went back to eating bread, cookies, anything I wished, because I kept losing weight. Over a period of months in early 2001, I lost twenty pounds, despite a ravenous appetite and eating all that I could eat. I also began to have gut pain so severe as to double me over and send me walking up and down the driveway because I could not be still. My husband grew very worried and walked with me. I was about to lose my writing career because of constant fatigue. I was able to function only about four hours in the morning, and was sleeping two and three hours every afternoon. I could not remember things; my brain felt it slogged along in Jello half the time. I was deeply depressed, which should not be surprising given all the other. I did try two other doctors, and a chiropractor, but non paid much attention. I must admit, though, I never mentioned the diarrhea, didn’t know to mention the steatorrhea, nor did I say anything about the stomach pain. Having had those things so often in my life, I simply paid them little attention. Then there came a night as I neared my 50th birthday, when I found myself at the kitchen sink, voraciously hungry, eating cold canned peaches covered in sweet, equally cold, salad dressing, because that was the only thing I could eat with my mouth on fire with yet another round of canker sores. “It’s only canker sores,” the doctor had blithely said, prescribing again some horrible medication that did not in the least work. There in the pool of light from the single bulb above the sink, I suddenly realized that I was really ill. I began to sob, with great tears running out of my eyes and peach juice out of my mouth, all plopping together in the sink. And I prayed fervently for God’s help to find out what was wrong. I do not think it was a coincidence how things unfolded. A week later, I came across a licensed clinical nutritionist at a new pharmacy I tried. I decided to book a consult. She was the first person to ever speak to me at length about all of my symptoms as a whole, the first person to ask certain questions about my childhood health. She was the first to ask me about—gasp!–my bowel movements. I remembered having seen mention of celiac disease when I had been searching medical sites online for a clue as to what could be my trouble. But the word disease put me off. I said that surely if I had a disease, the doctors would have found it. I went back to the internet and looked up celiac disease, which then was listed as celiac-sprue. As I read, my brain yelled, “Ohmygod!” I had all the major symptoms, as well as a few minor ones, such as my infertility, repeatedly being a ‘sickly’ and tiny child, and yes, one woman who gave her story said she had to urinate constantly, which was what I did, too. The kicker was the heredity factor; my mother had many of the symptoms, too. I decided to give the diet a try. My response was dramatic and clear, and added to this, my mother also did the diet, with the same amazing results. At the end of ten days, I telephoned the nutritionist and said, “You have worked a miracle. I’m going to live.” I danced as I hollered into the phone. Over the following weeks, months, and years, I was to learn what it would mean for me to live with celiac, as most of us call it. Initially this meant immediate lessons of the misinformation and skepticism and down-right rudeness that prevailed in the medical community. I decided to visit my doctor–after all, all the medical advice said to go to your doctor and have attention for malnutrition, which I certainly had. My doctor was rudely condescending, however, she wanted to run a test for celiac (not any tests for vitamin deficiencies or to anything in regard to my severe iron anemia.) I explained that tests for celiac after going gluten-free likely would not show the disease. Still, she ran a test, which turned out to be one blood test that was outdated. It showed negative, of course. A few days later the doctor called and said that she had spoken to a colleague, a gastroenterologist, who said there were more tests she could run. I wanted a referral to the specialist, but she declined to do that, as my insurance was an HMO. I decided that she did not have the knowledge to help me, and I needed to see a different doctor, when I had better insurance coverage. As it was, the diet was working! I consulted a competent gastroenterologist recommended by other celiacs of my area, who said that the response to diet showed it all and did not recommend a gluten challenge, which I was unwilling to take anyway. No way did I want to set myself back. Finally, in late 2003, through a very knowledgeable immunologist, I had gene testing, which showed the results that I carry the DQ2 gene. It took more than a year for me to get the diet down, and even then I had many mistakes, but I continued to progress and began to feel better and better. It was three years before my ferritin levels approached normal, and five years before I had consistent energy. Along the way I discovered that I am sensitive to soy and milk, and when I curtail eating them, my energy stays constant. I have hypothyroid and secondary Sjogren’s Disease, both that I attribute to the stress of the long undiagnosed celiac disease. I simply cannot say “thank you” enough to all of those who shared in internet forums, for my family and friends who supported me, and to God for answering my anguished cry that night at the kitchen sink. When I look back at my life, I see the miracle. I discovered a simple answer to my pain, had the willingness to follow it, and didn’t die in the meantime. I know I am not alone. Hundreds, dare I even say it is mounting into the thousands, have similar stories to tell of their journey to discover the source of their baffling illness and how to live in a ‘wheat-based’ world. I invite you to read their stories at National Foundation for Celiac Awareness, and to learn about celiac disease. The life you save may be your own, or that of a loved one. Curtiss Ann, you must put a twitter (and facebook etc.) share buttons so that we can tweet your posts when we are speechless. I was able to separate out the Tweet button from the Share + button, but it appears only on the blog post, not on the subscription post. I don’t know if it can be available on the emailed subscription message. Thanks for suggesting a change! It’s working! I tweet it. Thank you for sharing you journey. You inspire me! 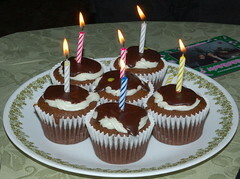 I am honored that you have chosen my humble cupcakes photo on your blog. I wish you well in your quest for good health, you are on the right track. My daughter and I bought a breadmaker this weekend and we made two loaves of gluten free bread! She was ecstatic to have toast again after so long without it. I suffered as well and in 1995 was told I was allergic to wheat (no mention of celiac or gluten). After I ended up in the ER with a reaction to spelt, it was time to do more research. Today I can eat no grains at all (not even rice) and have to stick to the SCD (Specific Carbohydrate Diet), which I do, except for the occasional piece of chocolate! I sure am glad I already knew how to cook because eating this carefully means mostly eating at home. After having friends and family tell me I was just ‘doing this’ to lose weight or to get attention, the trip to the ER was an eye-opener to all of them. I am glad to know you found out what was going on before it was too late. Thank you for telling your story. I have friends who also cannot eat any grains. My heart goes out to you, and I also stand in awe of your amazing strength. For the first years of being gf, I would only eat either plain rice with salt and pepper or my own pancakes that I used as bread–and not much of that! I have learned that I feel best when keeping grains to a minimum, therefore still have not returned to my former diet style. Meat, veggies, fruit, and bit of chocolate, and TEA! My sweet sweet friend, what an awe-inspiring story! I adored you before, but now I am overwhelmed by your courage and strength! Much love!!! !